Experts Larry Monahan and John Hargreaves ask – are you missing out on the convenience channel? Every consumer packaged goods marketer must choose from the gamut of distribution channels. There’s grocery, mass, club, value store, drug store – and then there’s convenience. Of all the channels, convenience is often the most overlooked, misunderstood and underappreciated, except by the Food and Beverage Companies where Larry and John have extensive experience. After all, $1 out of every $22 spent in the US every day is spent in convenience stores. Does underestimating the convenience channel mean you could be missing out on a highly incremental opportunity? How can your brands win with Convenience Shoppers? Are you starting with data and insights to broaden your reach to consumers? Can this channel be the perfect place for Trial with your shoppers? Which products in your portfolio are best suited for success in this channel? Beverages, snacks and meal replacement are natural fits but there are other opportunities too. Can your product be re-imagined in a convenience format? Pack size is not a one-size-fits-every-channel. Are you providing the right pack sizes for convenience? Is your organization providing the resources to win in this channel? John and Larry have restructured sales forces for success pursuing convenience opportunities. 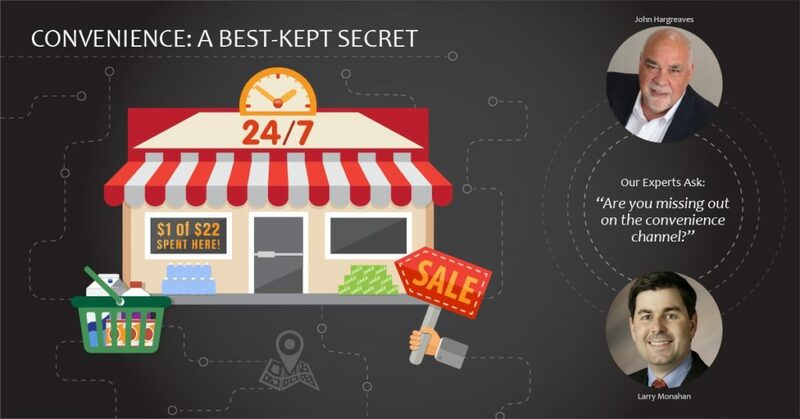 Are you optimizing your retail store coverage in this channel? It is critical for success! Did you ever investigate Telesales to help with smaller C-Store Chains? After the assessment work, if you commit to pursuing this channel, Simpactful can help from structuring your organization to win, to sales, marketing, package design, financials, and more. To learn more or contact Larry and John, please email us at contact@simpactful.com or call 925-234-6394. John has spent over thirty years optimizing revenues and profits. As a former Strategy and Finance executive at Mondelez-Nabisco-Kraft, he offers rich experience in sales building, distribution planning, customer segmentation, financial analysis and more. Larry offers extensive sales strategy, organizational structure and field sales leadership in the CPG industry. As a former VP at Kraft, he brings proven abilities in product distribution and new item speed to market, having led various route-to-market “test & learn” concepts. Meet Simpactful - a new CPG/Retail consultancy firm built for today’s challenges, with a team of experienced leaders from both CPG and Retail firms.